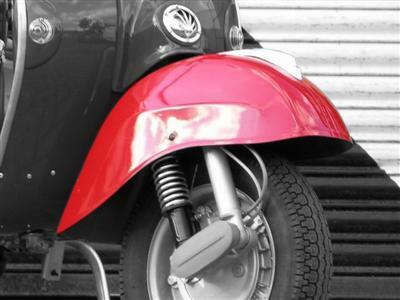 We also can supply a new LML scooter fully fitted with our retro bodykit and ready to ride. For more information and prices please view our 'scooters' from the navigation bar above. Can you turn my scooter into a vintage ? 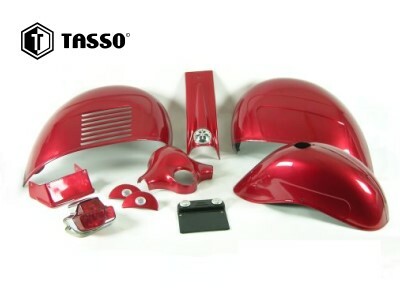 A basic kit includes Mudguard, Horncast, Panels, Indicator set Front & Rear, Rear Bumper, Rear Light, front suspension kit, headset top and speedometer. We also offer further items to enhance the vintage look, this includes, floor trim, badges, embelishers, glovebox, saddles, age dated numberplate. MUDGUARD - Made in metal. Remove your old mudguard, adjust fork mountings, fit our lowered sports shock (see below) then fit the GS Mudguard. Please note adjustment to your fork is required to fit the mudguard. We offer a fork modification service. HORNCAST - 3 designs, made in high quality ABS. Remove your old horncast, remove horn and fit to horncast, remove buzzer (LML only), compact wiring, attach horn wires and fit Horncast using existing screws. FRONT INDICATORS - Made in high quality ABS. They follow the contours of the legshield. Remove old indicators. 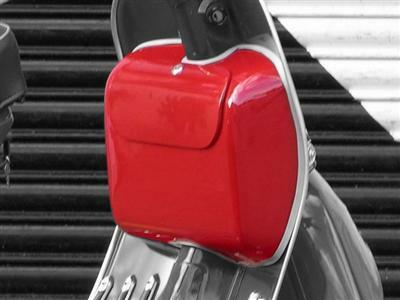 Fit our retro indicator which cover the hole left and colour coded to your scooter. Connect wires to existing connections in glove box. REAR BUMBER - Simple design visually lowering the rear of the scooter, made in high quality ABS. Remove your old bumper and fit the retro bumper using existing nuts/bolts. 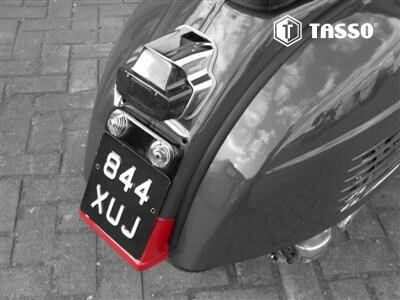 REAR INDICATOR MODULE - Design taken from the early douglas vespas which incorporated a reflector above the number plate. These super low profile with matching lucus lenses to the front indicators. Made in ABS, can be colour coded to scooter or painted black. Secure using the holes left by the number plate holder. Remove petrol tank ( not required for LML 4stroke, access can be gained behind LH panel ) wires are then passed through other existing holes above and connected to panel connectors under the petrol tank. Refit petrol tank. 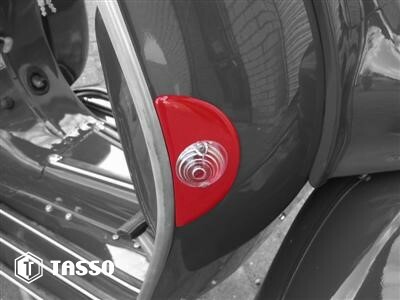 REAR LIGHT - Retro designs, made in ABS Chrome or also in polished aluminium. We favour the SS180 design when fitted looks fantastic. You can fit using the existing holes, alternatively for improved look mount 35mm lower. PANELS - Original design, made in metal. Simply remove your old panel, remove original rubber and fit this to the retro panel and re-attach to your scooter. HEADSET TOP - Made in high quality ABS. The smooth design echos that of the GS, with small simple speedometer and retains its disc brake if fitted. FRONT SUSPENSION KIT - Available in YSS sports or standard type. These lower the scooter, moving the wheel deeper into the mudguard. Supplied with spacer fitting kit. Please note your fork will require adjustment to fit our retro mudguards, please use our fork modification service. GLOVEBOX - Original design, made in metal. Replace your existing glovebox and fit using same holes. Two additional holes are required to secure lower fixings. Our retro front indicator set is required as the glove box is narrower. TRIM - To add the finishing touch, change your plastic floor runner end caps and centre mat to our vintage style. 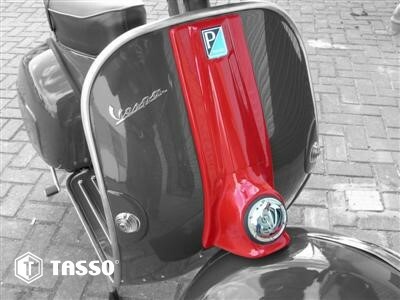 Vintage Vespa badge sets are also available. 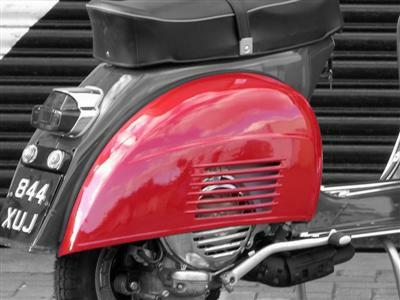 AGE DATED NUMBERPLATE - Yes we can apply an original age dated numberplate replacing your new type, which works in the same way as a private (cherished plate), once fitted most people will see the old number plate and think its an original scooter ! You can order a single item from a horncast to the full body kit from our parts website. If you are looking to retro fit the body kit yourself we offer our basic body kit in primer from £595 +vat or painted £895 +vat (1colour). 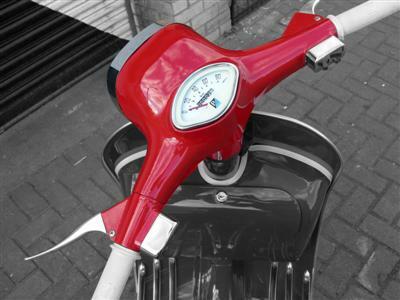 Or take the stress out and leave it to us, we can collect supply/paint/fit and return your scooter to you from £1295 +vat. To get started view more details.